The secret to a free Fortnite Battle Pass tier is hidden within this week’s challenges.. Complete all your tasks and you can find an easter egg leading you to your reward. Is Epic heading in the wrong direction with Fortnite? 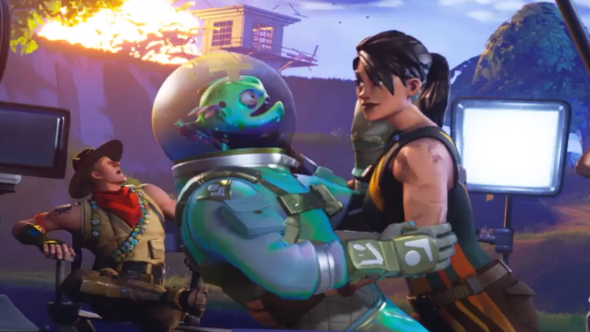 After completing the week one challenges you unlock a loading screen showing the new leviathan skin locked in a steamy embrace on a film set (we see your Shape of Water reference, Epic). Hidden in that loading screen image, and spotted by eagle-eyed reddit user Hoodskrat, is a Battle Pass tier floating above a prison tower. Visit the tower and you can find the Pass upgrade for the taking. You can only see this item if you’ve completed Blockbuster Challenge 1, which is achieved by clearing all of your week one challenges. Fortnite is a free-to-play game, but in order to access each seasons exclusive rewards, you need the Battle Pass. The Battle Pass costs 1000 v-bucks (£7.99/$9.99), and gives you access to daily and weekly challenges. Complete them, and your tier will rise and you can unlock new cosmetic items. If you need help completing the week one challenges, check out our rundown here.